CISD School Board raises their hands in unison to agree to continue going forward with the current bond the city has passed. The Board of Trustees of Coppell Independent School District meeting was held Oct. 23rd to discuss matters of the district. 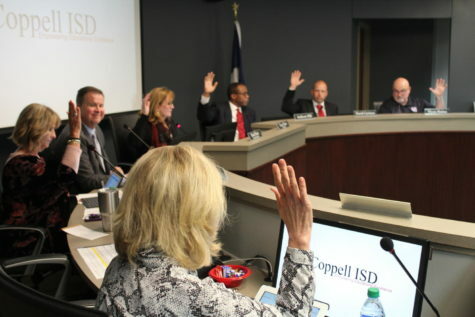 After conducting a community poll and forming a naming committee, the Coppell ISD Board of Trustees elected to table its decision for the naming of the district’s new ninth grade campus and middle school at Monday’s meeting at the Vonita White Administration Building. Susie Kemp returns to the Board as she was sworn in to serve in Place 2. CISD executive director of facilities and special projects Louis Macias presented updates on the construction of the new additions to the district. “We are way ahead of schedule.” Macias said. With building construction underway, CISD facilities naming committee representative Sangeeta Bachani presented her committee’s recommendations to the board. For the new middle school, the committee gave two options for a community vote Coppell Middle School South and Coppell Middle School West. The community voted in favor of Coppell Middle School South with 52 percent of the vote. For the freshmen center, the two options presented were CHS Freshmen Campus and CHS Ninth Grade Campus (CHS9). The community voted in favor of CHS Freshman Campus with 53 percent of the vote. While the community vote supported CMS South and CHS9, the committee recommended CMS West and CHS9 to the Board. After approving the budget amendments for 2017-18 and the financial report for September 2017, the Board moved to approve the purchase of 14 new 77 passenger school buses. 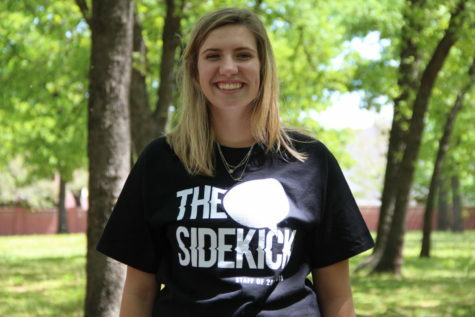 Following a closed session, the Board recognized the Coppell High School Round-Up yearbook for winning the Best of High School Photography Publication. Lee Elementary and New Tech [email protected] being selected as Apple Distinguished Schools for 2017-2019, one of 400 schools in 29 countries. The Board also recognized CHS senior Lekitha Ammaresh for receiving the Emperor of Science Award, sponsored by PBS Learning Media’s and Stand-Up to Cancer. Along with the award, Ammaresh received a new laptop, $50 stipend and the chance to work with a scientist at University of Texas Southwestern on a cure for lung cancer. Finally, the Board recognized the Coppell Police Department School Resource Officers Unit for receiving the Agency of the Year Award, as well as the Coppell Middle School East Officer Tonar Warmsley for receiving the School Resource Officer of the Year Award, both presented by the Texas Association of School Resource Officers.